Two of Australia's best chamber works by one of Australia's leading composers. Richard Meale shows two major elements of his style, from the corruscating directness and drama of Incredible Floridas (based on poetry of Rimbaud) to the harmonically romantic String Quartet No 2. 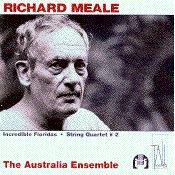 …the Australia Ensemble's Meale disc fairly tramples the competition. Incredible Floridas, Meale's homage to the poet Rimbaud, receives more detailed advocacy than the Seymour Group gave it for ABC Classics, and the second quartet comes alive as never before. …The string players… find all the passion in this score.… This is the most important disc of Meale's music on the market.